100 years today (26 October 1918) Cecil Chubb, a Wiltshire barrister and landowner, and his wife, Mary, gave Stonehenge to the nation. Saving the monument from who knows what damage and desecration to the stones and the surrounding land is a public spirited gesture to be celebrated. But even under government control, Stonehenge is not yet safe. There is another story, still unresolved, of potential damage to the wider setting of the stones. 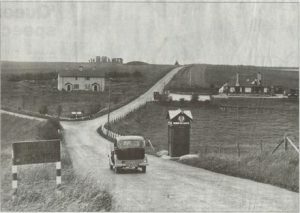 The government’s preferred plan for a tunnel 2.9 km (1.8 miles) long to reroute the A303 away from the Stonehenge stones, but under the Stonehenge World Heritage Site, and with portals within its boundary, “would impact adversely the Outstanding Universal Value of the property” according to UNESCO’s World Heritage Committee. It, together with academics, UK campaign bodies and the wider public, has urged the UK government to explore further options. Highways England has applied to the Planning Inspectorate for a Development Consent Order to build the A303 tunnel and Expressway. “[The Stonehenge World Heritage Site] is one of the few places… where you can see a special, sacred landscape developed over thousands of years. A landscape that is unique in World terms, and really should be protected in perpetuity. The Stonehenge Alliance, with other organisations, specialists and individuals are challenging the Government to withdraw the scheme and find a solution to the A303 that would protect the WHS surroundings of Stonehenge and respect the gift of the Stones to the nation. This is the alternative, non-motorway route from London to Exeter. It’s shorter than the M4 and M5, a fine and scenic route, cresting the wide open Salisbury Plain, and climbing and speeding down the steep banks of the Blackdown Hills. But there is a place on this road that elevates it to the status of one of the great journeys of the world. Just west of Salisbury, running down an incline, you spy a circle of grey, gaunt stones, massive, mysterious. 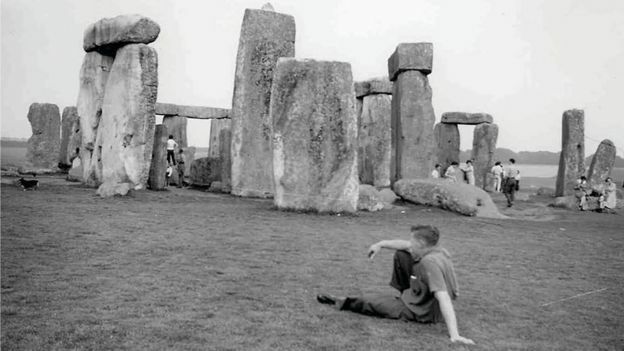 We know it’s Stonehenge, yet the thrill is as instant as ever, however many times we see it. I try to imagine what it must be like to come across this potent place unexpectedly, as many people surely do every day. There were innocent days, not so long ago, when you could park your car alongside and walk among these powerful stones, erected between 3,000 and 1,600 BC, and whose purpose we still don’t fully understand. As late as 1976 visitors could walk freely in the central circle, and even carve their names on the stones if the custodians weren’t looking. By then we were already well into the “what we do about Stonehenge?” debate. In 2013 the authorities finally “solved” Stonehenge, in the practical sense of presenting it to visitors, with the opening of a spacious visitor centre well out of sight of the stones. (The land is owned by the National Trust, and administered by English Heritage.) I believe this solution does “restore the dignity” of the monument, as one of the speeches on opening day put it. Now it looks as if the one remaining interference from modern life that prevents a sense of utter timelessness descending on this magical and perplexing place is to be removed, so that it once again stands remote and alone in the middle of an empty landscape. On the face of it that should be a very good thing. But is it? Or are we doing out the right way. In 2017 the government approved plans for a tunnel 2.9 km (1.8 miles) long on the A303 to take it out of sight of the stones, which are only a part of a wider World Heritage Site (WHS) encompassing many hectares of surrounding archaeology-rich downland. This preferred option would mean the tunnel begins and ends within the WHS, obliterating hitherto unknown historical features and relics. It notes: “Stonehenge World Heritage Site (WHS), which has been called “the most archaeologically significant land surface in Europe”…is 5.4 km across. All of it makes up a huge ancient complex that holds many secrets yet to be discovered. The petition site 38° contends: “All archaeology in the construction zones would be destroyed and the A303 would become the largest ever human intervention in an area fashioned and revered by over a hundred generations of our ancestors.” That is the outcome we face today, if the government’s preferred plan goes into effect. There had been calls to restore the isolation of Stonehenge for many years, but that didn’t stop some inappropriate visitor buildings being erected a short distance away, while the A303 became busier and busier. This is what used to happen. You approached from the east on the A303, then forked off to the north on the A344, which ran within yards of the outer stones. On the right was the old visitor centre, a 1960s facility connected directly to the stones by an underpass. You arrived suddenly at this uninspiring touristic pitstop, with no chance for a sense of mystery and wonder to develop. Visitors and traffic had to be moved away from the stones, but it took 30 years for this to happen. I wrote an article for the Sunday Times, in August 1983 outlining proposals to remove 20th century clutter from and around Stonehenge. In 1993, Parliament’s public accounts committee described the treatment of Stonehenge as a “national disgrace”. The road would be removed from sight of the stones. At the same time a bottleneck on a strategic route from London to the West Country would be removed and traffic speeded up. How big will the time savings be? One official estimate is a saving of eight minutes by the early 2030s. The present road has enabled huge numbers of people to see the stones as they pass, and they are usually going at a respectful crawl on this busy stretch. Who knows what inspiration has been given to young minds by the awesome sight. But continuing to expose passing drivers and passengers to the wonder of the stones, desirable as it might be, could not, of itself, be a valid reason for inaction. There are better arguments for not improving the road, or not doing it just yet, if we are not to have a longer tunnel or the longer above-ground by-pass that UNESCO proposes. Such as revolutionary changes, so far only dimly foreseen, in the way we will travel later in the century and beyond. I live close to the Grand Union Canal, a major highway in its day, at the end of the 1700s and in the early 1800s. Then, around 1836, Robert Stephenson drove his London to Birmingham railway through the tranquil fields near my home. It was over 100 years before the canal lost all economic relevance and sank into the drowsy recreational waterway it is today. I doubt if its promoters in the 1780s could have foreseen how it would be superseded so decisively by, at the time, unimaginable technology; just as, in the 1880s, companies providing fodder for horses were oblivious to the motorcar arriving, at sopeed, around the very next corner. We stand on the threshold of a transport revolution. Who can forsee the shape of private, public, and freight transport in a similar 50 year interval from now? There is already a decline in young people’s interest in taking the driving test, and even owning cars. The likely advance of autonomous cars could mean a higher carrying capacity on existing roads. More vehicles moving safely on the some road space. Who knows how automated railways, or new lines later this century, might impact on road use? What about drones or other automated aircraft taking freight of the roads? Such futuristic musings will probably not carry much weight in the consultation over most major road schemes today. If the case made today for such an ambitiously engineered route as, say, the one across the fields of N. Bucks, where the Oxford to Cambridge “Expressway” is likely to be driven, seems naively ambitious in the event of changing circumstances around 2070, there’s still no desperate harm done. Some traditional landscape and woodland grubbed up (possibly to be replicated elsewhere), and homeowners displaced or inconvenienced. This is the regrettable collareral of civil engineering projects, but not the irreparable injury to a place of planetary importance that the Stonehenge tunnel, in it present form, would represent. 100, 200, 300 years from now I doubt if writers will be able to echo the despair many environmentalists feel today over the ancient woods likely to be lost when HS2 is built. But how many will look at the works of transport minister Chris Grayling, who might be remembered as a sort of reverse Dr Beeching of his day, the massive portals of his 2.9 km tunnel still visible well within the confines of a place UNESCO gave its top accolade to, and curse our folly. Now is the time, even at high cost, to do the job properly and give this place the respect it deserves. We have the chance to get it right. Let’s take that chance.